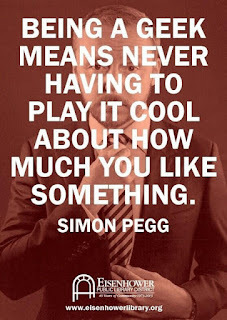 So true, Mr. Pegg. So true. Letting your geek flag fly is getting accepted more and more these days. It’s no longer taboo to love something intensely and unashamedly. I will fully admit to being a geek/nerd-girl or whatever you want to call it. 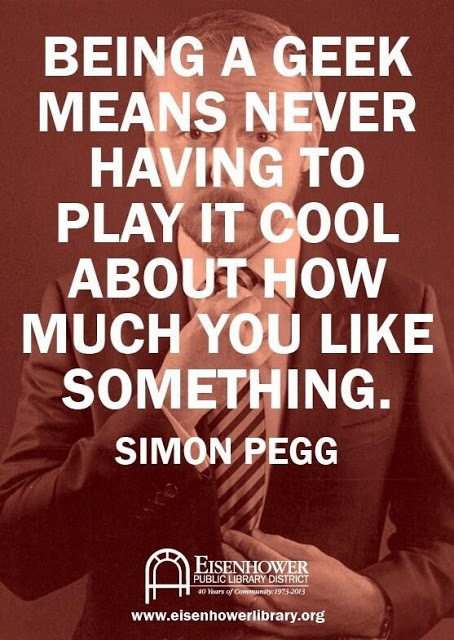 If I love something, I’m gonna love the CRAP out of it. I’m trying to distract myself from bouncing off the walls at the moment, so I have compiled this quick short-list of things I love to geek out over... There are soooo many more things that could be added to this (geeky t-shirts, office supplies, the costume I want to make, Steampunk, etc. ), but it's a decent start.... Enjoy. - Doctor Who – I love this show. A lot. A lot a lot. This show has found its way into my daily life... J now gets greeted with “Hello, Sweetie” when he gets home from work, “EXTERMINATE” is the most shouted thing in our house, many things are explained away simply as “wibbly wobbly timey wimey” or “humaney wumaney”... David Tennant and Matt Smith are in a BIG tie for my favorite Doctor. I love them both in different ways. And I am SO very sad that Matt Smith’s time is up. But as J keeps reminding me – I was pissed when Tennant left and ended up loving Smith, so I just need to chill out. And I’m trying. But I foresee an ugly cry when he regenerates into whoever is taking his place. - Harry Potter – Books, movies, games... Doesn’t matter, I love it. I’ve read the books and seen the movies about eleventy-billion times. I may seriously get something in both my eyes when Hermione tells Harry she’ll go with him to the forest at the end of the last movie. EVERY TIME I WATCH IT! Rumor has it that they are opening a Wizarding World of Harry Potter out here. I WILL BE GOING. And I will get a wand!! And I don’t care how many times J calls me a giant nerd!! - Big Bang Theory – Oddly enough, I resisted this show. Maybe because the first episode shown to me didn’t immediately grab my interest enough, but now I have seen every episode so many times I can recite them. While I love all the characters, my favorite will always be Sheldon.... Oh, Sheldon. How I adore you, you crazy crazy man. - Game of Thrones – Or as I like to call it “Everyone Dies.” These books and the show can be an emotional roller coaster if you allow yourself to get attached to ANYONE. But sometimes with the deaths there are ones that you are wishing for and wishing for and the payoff (albeit occasionally anticlimactic and not nearly violent enough) can be oh, so sweet. And it’s just fun to lose yourself in that other world... Just for a little while. - Super vague awesomeness that I’m not allowed to talk about just yet – yep. That. And try as I might to distract myself with some of the other things I am geeking out about, this is all that keeps popping back into my head. Wish I could give details, but I am not at liberty to discuss it. Just know that something awesome is starting. The first part is at the end of this month. With a possibility of more in the future. And it’s awesome. And WAY outside of my comfort range. And I have not stopped bouncing off the walls since I first found out about it LAST NIGHT. It has taught me that you never get anything without trying... And that it’s not dumb to want and try and do if it ends up making you feel super awesome and special. Did I mention it’s awesome? Excuse me as I go dissolve into a puddle of excited nerves! !